I simply did this in the hopes that it might help motivate someone out there that is considering going natural, transitioning, recently Big Chopped or Newly Natural (perhaps even already Natural!) It is funny looking back at how my hair has changed since going natural. Apart from the obvious drastic improvement after I stopped using relaxers and actually taking care of my hair I notice a change from when I finally stopped using chemical dyes. I was a dye FREAK! I went through colors like people change clothes! It did have its toll on my hair which is why I personally choose to stop. Anyways ladies I think the pictures summarize what I am trying to say :)! 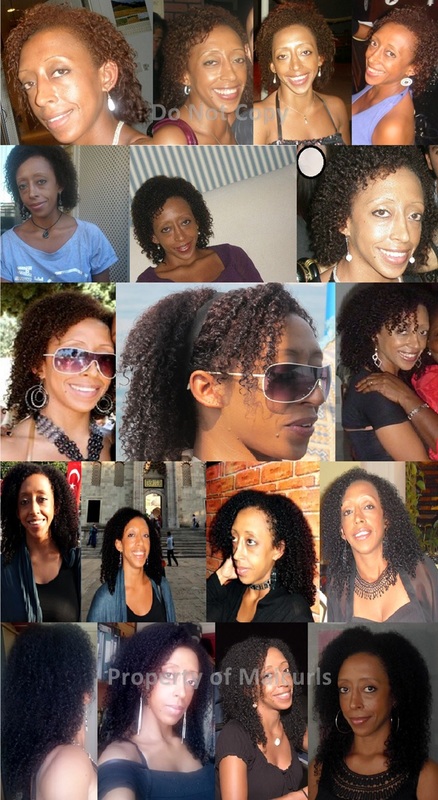 I have posted the same picture in a new page under the “Mai Hair Journey” Tab called – ‘(2009 – 2013) Summary Look’ but added some details of each row. I would LOVE to hear from you! What has your experience been? Have you gone through photos too? Are you considering going natural? Transitioning? Big Chopping for 2014? Let me know! This entry was posted in Damaged Relaxed and Dyed Hair (relaxed days), Getting Inspiration through others, Hair Breakage (relaxed days), Hair Cutting, Hair Journey from Relaxed to Natural Curly Hair, Inspiring Others, Natural Ingredients for curly hair, Protective Style, Transitioning to Natural Hair (relaxed days), Uncategorized and tagged natural hair journey, protecting natural hair, taking care of natural hair, transitioning from relaxed to natural hair, transitioning hair on December 9, 2013 by Maicurls. This is wonderful! Your hair grows so fast!